except 26 July to 20 September no closing days. The Dresden Armorys electoral parade garments belong to Europes most important cultural heritage. In preparation for their forthcoming new permanent presentation in Dresdens Palace, the textilesstored in inaccessible depots since World War IIrequire extensive conservation treatment. We owe thanks to the Abegg-Stiftung in Riggisberg , Switzerland, for their generous support in this ambitious endeavor. Starting in 2002, they volunteered to conserve Prince Elector Moritzs Parade Gown, the oldest garment in our collection, dating to the mid-16th century. The treatment was undertaken at the Abegg-Stiftungs internationally renowned conservation facilities. 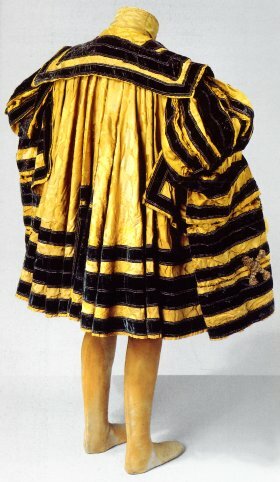 Reportedly, the majestic yellow-and-black ensemble originally consisted of coat, doublet, breeches and nether hose. It represents an era of fashion painted in the grandest splendor by such masters as Titian, Holbein the Younger and the Cranachs. Dresden is the only place where original examples of princely fashion of that time, influenced by Spanish and Italian taste, have survived. In 2009 the Armory received the comprehensively conserved Parade Garment from the hands of conservators Bettina Niekamp and Agnieszka Wos Jucker. The nearly criminological archival research and the consequent diligent preservation restored the status of the gown as an historically authentic costume. It also regained its aura as a souvenir of one of the most important Wettin princes. Both metaphorically and concretely speaking, the suit demonstrates the greatness of Elector Moritz (1521-1553): Thanks to him Dresden became the capital of Saxony and an art metropolis. As a token of our gratitude to the Abegg-Stiftung and to commemorate the unprecedented success of its conservation, we display this unique Renaissance ensemble here in combination with additional examples of contemporary fashion.